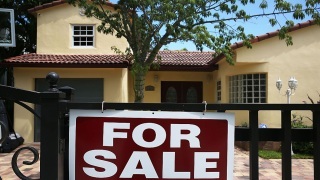 File image of a for sale sign is seen in front of a home on August 21, 2015. The West Contra Costa Unified School District is teaming up with a startup company to ease the burden of home down payments for its teachers. The school district said it loses about 15 percent of its teaching force each year and the partnership with the startup Landed will improve retention. The San Francisco-based company says it will pay half of the down payment on a home, up to $120,000, and teachers are responsible for the other half. If the down payment is $160,000, for example, the teacher will pay $80,000 and Landed will pay $80,000. The teacher's payment can be sourced from loans, as long as they are able to pay at least 10 percent of their half. The teacher can also take less than a 50 percent loan. When the home is sold, Landed shares 25 percent of the sale whether the property rises or falls in value. If the teacher does not want to sell their home, they will have to repay Landed between 10 to 30 years after the initial investment. Landed is backed by the Chan Zuckerberg Initiative, angel and venture capital investors and other large foundations. Matthew Duffy, superintendent of the school district, said Richmond is one of the few places in the Bay Area where home buying is still relatively affordable. The district has hired more than 800 teachers in the last four years but said it is struggling to keep its educators. "This is just one of the innovative opportunities we have worked on to assist our teachers to stay in our communities and continue to help our students thrive," Duffy said in a statement. The district will host a teacher housing fair from 4 to 6 p.m. Monday at DeJean Middle School at 3400 MacDonald Ave. in Richmond.